My husband Ryan had the privilege of studying abroad in college. We met shortly after he returned from his semester in London and many of our early conversations revolved around his European travels, which included a Spring Break in Greece. I hung on every word—not just because I was majorly crushing on this new boy I’d come across, but because I had always loved to travel and Europe was one place I hadn’t yet been. At the time, neither of us was nearly as interested in food as we are now (just check out my restaurant reviews page for a recap of eats from some of our trips! ), but I do remember he talking about the Greek salads he enjoyed over his week on the islands. Every time he mentioned them, he would talk about how they omitted lettuce and instead served large chunks of cucumber, tomatoes, and feta. He was enthralled with this new version of a salad, so different from the iceberg lettuce we were used to creating salads with during our meals in the dining hall. Since then, we still eat a lot of salads that are greens-based. I do try, however, to branch out from time to time. 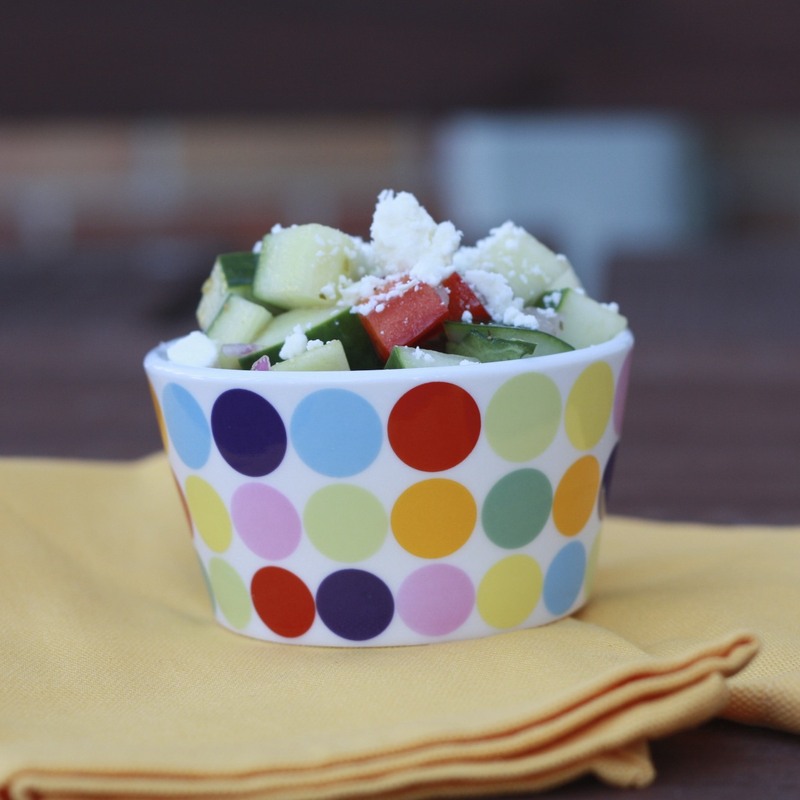 This cucumber and tomato salad was quite similar to another I’ve made, but the cucumbers are chopped differently in this one, more closely reflecting the Greek salads from Ryan’s memories. This made a large portion—enough to feed at least five or six. We enjoyed it two days in a row with burgers and I brought it to work and finished it off on day three. The vegetables didn’t lose much bite (although it maybe got a little watery), so this would be an excellent thing to make at the beginning of the week and eat for a few days! 1. Toss the cucumbers, red pepper, and red onion in a large bowl. 2. In a small bowl, whisk together the red wine vinegar, water, oregano, and olive oil. Season to taste with salt and pepper. Toss with cucumber mixture. 3. Refrigerate until ready to serve. Sprinkle with feta just before serving.